New Skyris cameras for planetary, lunar and solar imaging. Celestron and TIS announced that they are launching a set of Skyris planetary cameras. Those are fast USB3 based cameras with ICX618, ICX445 and ICX274 Sony CCD sensors. 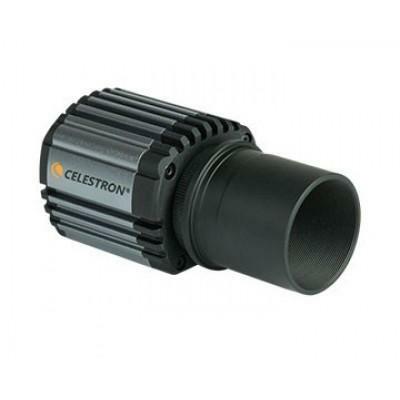 Those Celestron cameras are based on TIS USB3 cameras sold on the machine vision market. Initial prices showed up for UK and USA. Those for Europe differ a lot from prices on TIS website for the USB3 machine vision cameras. Prices in USA match those for TIS USB2 cameras. From those three models the mono ICX445 looks as the most interesting - this sensor is proven in solar and lunar photography. The older ICX274 sensor isn't very fast, but may be interesting to those wanting small pixels and bigger sensors to fit more Sun at high resolution (there are newer cameras but with bigger pixels, like the e2v sensors). The ICX618 model is designed for planetary imaging, although don't expect to photograph planets at 120 FPS. At max it will be 60 FPS, while on dim planets like Saturn - 30 FPS only (and there are no tests for artifacts in those USB3 fast cameras!). At the moment there is no informations if those cameras will be supported by other apps than Celestron iCap. As it's TIS based it won't rather support fluid capture framerate or ROI (subframe) with faster capture framerate... I'll post updates if something clarify.